I decided to dedicate time and energy towards getting in shape. As a business owner and mom of two young children, time spent on improving myself (specifically not related to my work or my kids) is also known as a precious indulgence. That’s right, I’m at the point where I equate working out with getting a mani-pedi. Time to work hard on me. You can read more about making time to work on yourself here. But since my youngest is turning three in a few short weeks, I’ve been feeling like it’s really overdue that I lose the last 20 lbs of my “baby weight.” Unlike my speedy 6-month rebound from my first pregnancy, I’ve definitely put my fitness focus on a back burner this time around, telling myself “I’ll get to it when I’m ready.” Just as my son turned a corner, kicking his diapers to the curb and deciding he was a big boy, a baby and a toddler no more, I knew THIS was the time to make a change for myself. So I reached out to Dwayne Wimmer. Each week we put appointments on our calendars to work together. This commitment to someone other than myself has made me more accountable to dedicate that time. The time I spend working out at Vertex feels like it’s over in a jiffy. I’ve committed to a half hour on my calendar, twice a week. Each workout, I warm up and then we cork through a full-body program. I work HARD in each exercise, but each one is completed in such a short time so I don’t feel completely exhausted afterwards like I would after a long run or a bike ride. If I had to sum up my experience so far in one word, I would say that they coach precision at Vertex Fitness. I’m amazed by the technique that goes into each exercise. I don’t *just* push weight around when I’m working with Dwayne, Matt, or Todd, I know I am isolating and exhausting each muscle. And I’m not wasting time by going through the motions too fast or with sloppy form. Most of the time, they help me reach higher than I think I can. After each workout, I’m finding that I can feel the work I put in. All. Over. It makes me smile because I like pushing my body to go beyond my comfort zone. I love that I’m feeling more athletic again and the results I’m seeing as we add more weight week after week tells me that I am getting stronger. 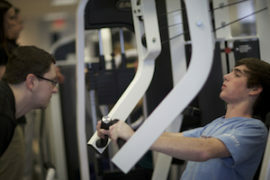 Each time I work out at Vertex, I’ve been impressed with the staff’s expertise and professionalism. I’ve had a great experience so far, so I offered to write here occasionally about this journey.